The industries located in Charlotte, Michigan gives 4,045 of its residents employment and focuses mainly on manufacturing, public administration, and retail. These three sectors employ more people than would be expected for a city of Charlotte’s size. The highest paying industries are transportation and warehousing, finance and insurance, and waste management services. The median household income for the Eaton County city in 2017 was $42,947, which was a slight decrease from the previous year. Charlotte’s population also declined 0.15 % from 9,057 to 9,043 between 2015 and 2016. In addition to these decreases, the median property value also declined from $109,900 to $105,400. But what’s not declining is the amount of debt that people are amassing in Charlotte and other Michigan cities. Most residents in Michigan cities like Charlotte appear to be credit savvy with mostly high credit scores. When it comes to credit card debt, on the surface, residents of Charlotte and other Michigan cities look pretty good since they manage to keep their debt levels lower than the national average. But one of the main reasons for that is that instead of looking for a viable debt-clearing solution, many residents rely on bankruptcy, which reduces the state’s average debt statistics. A loan can help you consolidate debt, lower your interest rates, and pay down debt faster. For this method you need to have good or excellent credit to qualify for a low interest rate. This option makes the most sense for consumers with over $10,000 in debt but with good credit and enough reliable income to make regular loan repayments. If you own a home, you can refinance your mortgage and use the extra cash to pay off current balances and get lower interest rates. The danger with this method is that if you can’t make your monthly payments, you could lose your home. Companies like Freedom Debt Relief negotiate with your creditors on your behalf to reduce the overall amount you owe. Depending on the settlements negotiated, you could end up paying less than what you currently owe a creditor to be free of the debt. This option is great for people who are struggling with high debt and have less than excellent credit. From debt payoff apps to balance transfer cards, there are many ways to repay debt on your own. But usually, this method boils down to sticking to a tight budget and paying extra on your accounts until you’re out of debt. So, if you’re good at budgeting, have extra income to spare, and can avoid taking on new debt, DIY could work for you. A credit counselor can review your finances, create a debt management plan for you, and they might even be able to set a lower rate with your creditors. By choosing this approach, your credit card accounts will be closed but your principle debt will stay the same. 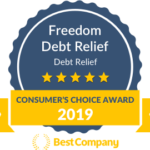 Call Freedom Debt Relief at 800-910-0065 and speak with one of our Certified Debt Consultants now to understand all the options and get help finding the solution that’s best for you. Make today the day you get on the path to a fresh financial start.